Adam Roberts is one of those rare authors who not only manage to create a rewarding, entertaining story but also does so in a way that challenges your perceptions, encourages you examine that which you take for granted and often plays on accepted norms of the genre. Jack Glass is no exception. We begin the story with a personal introduction from the narrator, who at that time is unknown and explains that Jack Glass is a murderer and the story will tell of three murders committed by Jack and yet even knowing this in advance we will be surprised to find out it was Jack who was the killer and even more surprised to find out how and why he did it. Roberts plays on the established crime genre mixed up with science fiction and delivered in a style that does feel very much like a tale taken from the "Golden Age" of science fiction; but brought up to date with a modern approach and uncompromising voice. The story is set as three closely connected novellas - "In the Box", "The FTL Murders" and "The Impossible Gun" - which do sound very much like a science fiction story of the mid 20th Century. 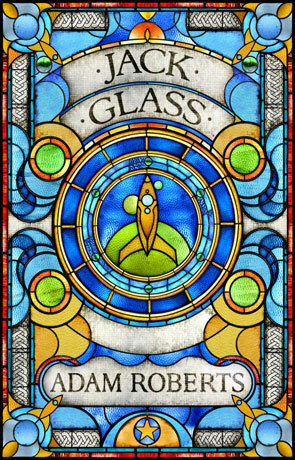 The future setting of Jack Glass is one where the whole of the Solar System has been colonized even to the point of hollowing out asteroids to provide suitable dwellings and yet in this expansive vision much of humanity remains in squallor providing a cheap workforce (after all robots and machinery cost money to replace whereas human beings do not). This also includes a slave workforce for those few who are lucky enough to live in opulent luxury; who surround themselves by servants doped up on chemicals to remain fiercely loyal and trust-worthy. Jack Glass himself is an intriguing character, one of those protagonists who remain distinctly, purposefully distant; you don't get the opportunity to really bond with the fellow, even if you can to a certain extent relate to his situation (especially towards the end) which helps to create this miasma of mystery that surrounds Glass. The other main characters do make up for this lack of bonding with Glass though - especially Diane and to a lesser extent Eva who are both genetically engineered and fiercely intelligent (Eva on her 7th PhD at the tender age of 21). These provide a cross section of colour and vibrance, providing an effective counterpoint. We don't get any time wasted on back-story or world-building, instead we are launched right into the story of murder and intrigue that underlies the intricate and inventive plot. As the "who dunnit" has already been spoiled right at the start (a very clever move by Mr Roberts) we are free to focus on the how and even more importantly the WHY. The story that unfolds is simply mesmerising, like many classics of the golden age it's this story that matters, wrapped up in an often casually described future technology that nevertheless is rooted around something quite grand, in this case the late McAuley's (named after the not late author Paul McAuley) rumored discovery of the game-changing technology FTL (Faster Than Light). The result is a timeless quality, partly due to the way the technology is handled but also largely a result of the authors distinctive vernacular. I loved this mix between detective fiction, mystery and sci-fi which is liberally dosed with tense scenes and unafraid to provide graphic descriptions when the need arises but without resorting to gratuity or going OTT. The ideas are also grand, firstly we have the whole question of how humanity would adapt to life outside of Earth and what sort of society would result but the bigger question concerns the Fermi paradox, that contradiction between the high probability of life elsewhere in the universe and lack of contact with or evidence of any other advanced civilisation. With the age and vast scale of the universe unless the earth is unique our own galaxy should be teeming with life and if that is the case why is there no evidence of this abundance. Roberts hints at a clever solution to this problem and does so in quite an ingenious fashion within the story, expounding on the suggestion that we could be contained forever within our own little solar system. I've read a few of the authors novels and it's clear that each new story is an improvement over the last; this is an author who is seriously going places and those places are full of granduer, of vast imagination and it's a real treat being a part of that journey. Jack Glass is one of those books that you really don't want to end, clever, inventive and above all a fantastic read, one of THE books of 2012. Written on 21st September 2012 by Ant.